Changdeokgung Palace is second to Gyeongbokgung Palace which is located nearby. I visited this palace many times since I first came to this country. Changdeokgung Palace, according to history, was built in 1405 during the 5th year of the third King Daejong's reign. The completion of Changdeokgung gave a harmony to the Hanyang (old Seoul's name) as Gyeongbokgung Palace was to the West and Changdeokgung is to the East. Most of the structures of Changdeokgung got burnt down during the Japanese invasion in 1592. However, the palace was reconstructed in 1610 and since then had been serving as the main palace for almost 300 years until the last king's dynasty of King Sunjong. Being a palace to the East of Gyeongbokgung, Changdeokgung was simply called as "East Palace" together with another palace nearby called Changgyeonggung Palace. Changdeokgung was built in harmony with the area's topography, and its architecture is with a dissymmetric beauty and considered unique to Korea. The palace's layout is perfectly made in harmony with the natural surrounding - building it closer to the mountainside. It is believed that other palaces were influenced by its layout. Again, in 1917, Changdeokgung Palace, including Daejojeon, the queen's palace, was consumed by fire. According to the source, the materials of Gyeongbokgung Palace were used to rebuild the structures of Changdeokgung. During the moving process, many structures of the palace were modified and some got damaged. The rebuilding of Changdeokgung started in 1991 and is still ongoing. Despite the destruction of most structures of the palace, most of its original design and architecture have been restored making the palace a representative of Korean palace architecture. The UNESCO World Cultural Heritage approved Changdeokgung Palace in 1997 for having an outstanding architecture and its design in harmony with the natural landscape of the area. I have been here many years ago and did not remember how it looked like back them. I am pretty sure that there are some changes but at the same time they caretakers would not want to change its original design. 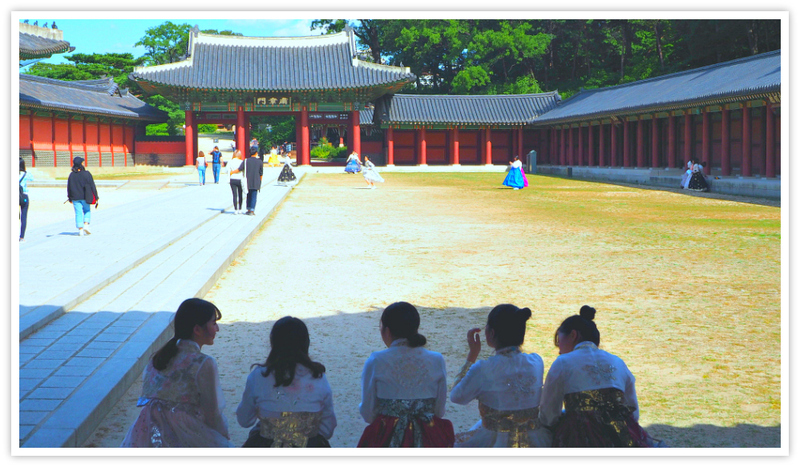 Now, let me tell you something about Biwon or the “Secret Garden.” It is Changdeokgung Palace’s highlight. That is because it is thought to be the most attractive place built inside the palace and the most mysterious one. It is the most popular among the palace’s sites as visitors tend to find out why it is called as ‘secret’ to answer their curiosity. It is secret not because something is secret in it but because it is somewhat hidden and can be approached on a suitably mysterious path as it is concealed by the trees and their leaves. At the heart of Biwon, you will see a lotus pond. This pond is one of Seoul’s representative pond as it is the most photographed sights. It is bedecked with colorful lotus flowers in late June and early July - summertime!. Overlooking the mesmerizing pond is a small building which served as a library and study room. The library is where the king spent his time reading and studying. It has tiny gates blocking the entrance path that was used as his checking mechanism. Actually, Biwon is the last stop on your tour, and it is where most visitors would take time to relax after and winding tour around the complexity of the palace. Seonjeongmun is the main entrance to the Seongjeongjeon (Hall) where the king conveniently used to hold his official meetings and other state of affairs discussions. This is where the King works at his convenience regarding the state of affairs with his top officials. The building was constructed to the East of the Throne Hall. All sorts of serious gatherings are performed in this building such as the routine morning meetings, reporting on domestic affairs as well as national seminars. The narrow area surrounding the hall functioned as offices of the secretaries, while some are for storage rooms. If you can notice, this is the only remaining palace structure with a blue-tiled roof inside the palace. The corridor leads you from Seongjeongjeon Hall then out to Seonjeongmun Gate. Seongjeongjeon Hall used to be a royal shrine for royal funerals which is evidenced by the corridor which is preserved at its present state. 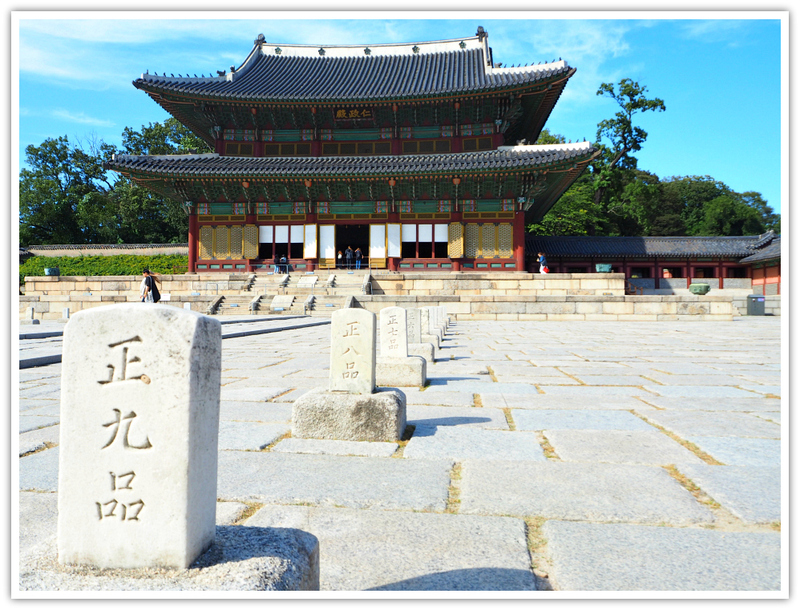 Nakseonjae Complex is where King Heonjeong housed his concubine because the queen could not give him a child. The king ordered to build three buildings to the East of Junghuidang House. Nakseonjae was his living space and where his books are being kept. Inside this complex, Seokbokheon, was where the King's concubine Gyeongbin resided. Sungangjae was the new residence of his queen (Queen Sunwon) when the king he remarried. King Heonjong built Nakseonjae with very simple designs and not as colorful as the traditional style during that period. The king was believed to like the foreign culture which was revealed through the designs and calligraphy on the title boards of the entrances and the main room. According to the source, famous Chinese calligraphers wrote the title boards of the front entrance of Nakseonjae.